Wash your windows with a fresh cleaning method that has met the requirements of over 94% of our customers in Livesey! Q: What does the window cleaning in Livesey involve? A: Our service will be performed by experienced and fully vetted Livesey window cleaners. They'll also don branded uniforms, so you'll easily notice them as soon as they arrive at your premises. A: Basically, this is a lengthy pole that shoots water under powerful water pressure. It allows the cleaners to reach the fourth floor of any commercial or residential building without lifting their feet off the ground. A: Not at all! The specialists will make use of a special de-mineralised water container inside their van. However, if the tank is empty, we will gladly take your offer. A: You need to make sure that there will be a empty parking slot within 30 metres from your premises and on the same side of your panes. The technicians also need to have an effortless access to your property. After reading through lots of customer feedback, we've adjusted our window cleaning Livesey's rates. Now, you can schedule our service at prices that are nothing short of affordable! For further details, please consult with our price table below. Based on your needs, our window cleaning Livesey can provide you with three choices. 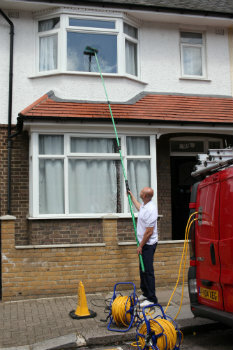 If you choose external cleaning, the specialists will deploy a special water-fed rod. This equipment can expand up to 22 metres in length, which is comparable to the height of a four-storey premises. The Livesey window cleaners will use purified water under high pressure that will wash away all streaks in almost an instant. If you run a lofty property instead, then opt for our rope access window cleaning. There, a team of approved abseilers will methodically polish your windows until they see the mirror image of the setting sun. For your comfort, we inspect the washing equipment on a day-to-day basis and can send COSHH records at your request. We are delighted to report that our window cleaning in Livesey has been scheduled by several bordering areas as well. You can learn which locations we visit below. For those of you who'd rather book window cleaning services Livesey SE1 online, fill in our get a free instant quote form.